Like its hero, extraordinary in every way. 127 min. Columbia Pictures. Directors: Terry Gilliam, Michele Soavi. Cast: John Neville, Eric Idle, Sarah Polley, Oliver Reed, Robin Williams. Because of its troubled production and weak box office, Terry Gilliam's action fantasy The Adventures of Baron Munchausen has been often dismissed as a folly. But this deliriously crackpot fable about belief being more potent than reality and audaciousness being more important than conformity is arguably second only to The Wizard of Oz when it comes to imaginative, even lunatic screen fancy. Despite its comic violence and double entendres, Munchausen is as certifiable as a kid-friendly delight as it is insanely certifiable. Gilliam and co-screenwriter Charles McKeown take as their source 1785's The Surprising Adventures of Baron Munchausen, Rudolf Erich Raspe's tall-tale compendium imspired by real-life German adventurer Karl Friedrich von Münchhausen (the namesake of Munchausen syndrome, a factitious disorder). Given the source's piecemeal nature, the screenplay is rather brilliant in its choice to place "the truth" into a hall of mirrors. In a time identified as "late 18th Century...the Age of Reason...Wednesday," a theatre troupe performs tales of the Baron even as its city suffers under a border-dispute bombardment by the Turkish Army. In the middle of the show, an old man claiming to be the Baron (John Neville) intervenes to tell the "true" story of his fabulous adventures. As the film moves from its focus on stage artifice to pure cinematic artifice, the stage actors playing the Baron's companions double as the genuine articles: super-speedy Berthold (Eric Idle), keen-eyed sure-shot Adolphus (McKeown), super-sized strongman Albrecht (Winston Dennis), and Gustavus (Jack Purvis), a diminuitive fellow with special lung power and hearing. The doppleganger tactic recalls Oz, as do the film's dual realities and a hot-air balloon as vehicle of escape. The story's nastily earthbound "Miss Gulch" is "public servant" Horatio Jackson (Jonathan Pryce of Gilliam and McKeown's Brazil), a supremely bureaucratic city official who blusters to the Baron, "I am afraid, sir, you have rather a weak grasp on reality." The Baron's retort: "Your reality, sir, is lies and balderdash. And I'm delighted to say that I have no grasp of it whatsoever!" In a bit of dream logic that rings true, the extraordinary hero ages in reverse when "rejuvenated by a touch of adventure" that renews the twinkle in his eye and the sparkle in his smile. His aversion to doctors likewise demonstrates his determined escapism from bothersome realities that threaten to keep the Baron down. Though Jackson insists, "He won't get far on hot air and fantasy," the Baron constantly rises, whether hitching a ride on a cannonball, launching in that hot-air balloon, or dancing on air. The latter image—cherubs doing fly-bys as the buoyant Baron waltzes with Venus—ranks among the most beautiful, free-spirited moments in cinema history. The blacksmith god Vulcan (a hilarious Oliver Reed) steams below as his goddess wife (breathtaking beauty Uma Thurman, then a teen) soars. In another astonishing sequence, Gilliam and McKeown toy with Cartesian dualism on their trip to the Moon: the King and Queen of the Moon (Robin Williams—credited under pseudonym Ray D. Tutto—and Valentina Cortese) sport detachable heads that intellectually vie with their pleasure-seeking bodies. Williams gives one of his most effective comic performances in depicting "the king's lunacy," randily raving even as the innuendo-laden sequence cleverly flies over kids' heads. Gilliam and McKeown provide children an entry into the story through the original character of Sally Salt (Sarah Polley, wise beyond her weeness). The daughter of the acting troupe's larger-than-life proprietor (Bill Paterson, never better), Sally proves more adult than the Baron, a state of affairs resulting from growing up in a war zone. Sally presses the Baron to keep his promise to return to her endangered hometown and save the day, while the Baron cheerily embodies the joys of irresponsibility. Sally's other useful quality is her child's credulousness—she recognizes the Baron's true identity—whereas the Baron demonstrates that the daftness of old age is its own strange insight in a claustrophobically "reasonable" world. For a film so concerned with adventure, there's an amazing amount of satire, satire so clear (and yet not so heavy-handed) that even kids can understand it: a dramatization of the mentality behind the political assasination of an idealist, and Vulcan proudly patting a nuclear missile he's at a loss to rationalize (though one must elsewhere ignore the Baron's cheerful butchery of Turks). Such eminently sane messages balance what's on the other side of the film's scales: its spirited triumphs over common sense. Dramatizing every man's fondest and most impossible wish, even the fearsome Angel of Death loses its sting as it attempts to fell the unsinkable Baron. Surely cheating death for as long as possible is, in fact, the sanest of lifestyle choices. Designed after illustrator Gustave Doré (who provided art for the most famous edition of the Baron's adventures) and primary film fabulist Georges Méliès, among other sources, the film's photography (by Giuseppe Rotunno with an assist from uncredited Gilliam regular Roger Pratt), production design (the brilliant Dante Ferretti), and costume design (by Gabriella Pescucci) are second to none. The pre-CGI special effects are supremely surreal, and Michael Kamen's music —including the delicious ditty "The Torturer's Apprentice" (lyrics by Idle)—represents a career pinnacle. In short, The Adventures of Baron Munchausen is, like its hero, extraordinary in every way. 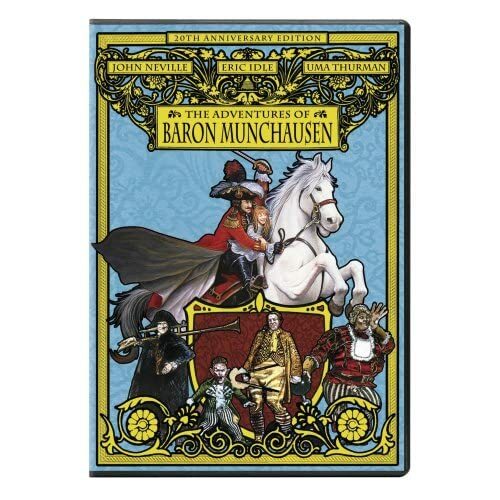 More than most films in cinematic history, The Adventures of Baron Muchausen deserves a special edition, since the story of the making of the film parallels its outlandish, adventure-laden fable (a point Gilliam insistently makes in the new bonus materials). Andrew Yule's Losing the Light: Terry Gilliam and the Munchausen Saga—highly recommended—tells the true story in all its gory details, but now Sony has bravely (okay, with legal disclaimers appended) produced a magnificent special edition of the film for DVD and Blu-Ray, including an expansive new documentary, commentary, and deleted scenes. For starters, the transfer is wonderful. Munchausen is a film whose source material varies, due to the special effects processes used, but Sony handles it as ably as its possible to do. In spots, the blacks are not as true as one might hope, but the fine detail is otherwise excellent (so excellent that previously unseen wires are occasionally visible), and film grain is natural (instances of dirt appear to be endemic to those special effects processes). And the robust surround track does a service to those cannons and Michael Kamen crescendos. The screen-specific commentary by Gilliam and co-writer Charles McKeown finds the two in good, bantering form, addressing the conception and filming of each sequence as they go, along with interesting trivia (Valentina Cortese's skill at getting close-ups, Gilliam's inspirational meeting with Fellini, etc.). 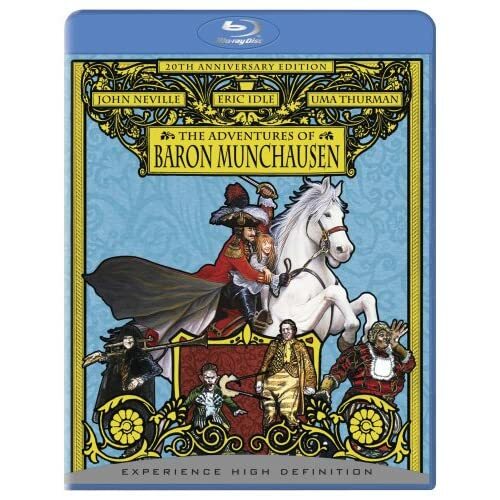 Exclusively on Blu-Ray, double up with the "Marvelous World of Munchausen" feature and you can concurrently enjoy pop-up details (behind-the-scenes looks, facts about the real and fictional Baron, Gilliam quotations about the film, and "how the Munchausen storyline fits into the three films Gilliam shot in the 1980s"). The disc's centerpiece is the terrific new documentary "The Madness and Misadventures of Munchausen" (1:12:08 with "Play All" option). "Flights of Fancy" (29:47) shows off bits of behind-the-scenes footage and gathers Gilliam, McKeown, John Neville, Sarah Polley, Robin Williams, Eric Idle, Jonathan Pryce, Bill Paterson, producer Charles Schuhly, executive producer Steve Abbott, former Columbia Pictures president David Picker, Film Finances president Richard Soames, and production designer Dante Ferretti. I wouldn't have believed this assemblage of commentators possible on a home-video budget, but this doc is clearly a labor of love. "Caught in the Act" (16:50) continues the story with additional contributors: first assistant director Lee Cleary and U.S> casting director Margery Simkin. "The Final Curtain" (25:41) wraps up with two new chatters: production executive Joyce Herlihy and optical effects supervisor for Peerless Camera Kent Huston. Gilliam fans will be eternally grateful for this well-produced feature on the slippery truth behind the various Munchausen fiascoes. "Storyboard" sequences (30:03 with "Play All" option) come framed by an intro and outro: "As We Once Dreamed It: An Introduction by Terry Gilliam and Charles McKeown" (:42) and "As We Once Dreamed It: Some Afterthoughts by Tery Gilliam & Charles McKeown" (:50). In between are the storyboards narrated—script and sound effects alike—by the two filmmakers: "Secen 51: Baron Saves Sally" (2:51), "Scenes 53-68: A Voyage to the Moon" (21:12), and "Scene 129: The Baron and Bucephalus Charge the Turkish Gates" (4:44). These valuable, fascinating excisions (wisely downscaled from the original shooting script, by the way) are accompanied by four "Deleted Scenes" (3:37 with "Play All" option) in scratchy 1.33:1: "Alternate Opening" (1:08), some no-audio shots of the Turkish army; "Mutiny on the Stage" (:56), with Salt berating his cowardly actors ("You give escaping a bad name! "); "The Rules of Warfare," an especially unfortunate cut featuring a funny Python-esque riff on Wednesday armistices, and the accurately described "Extended Fish Sequence" (:54). If you've never seen this film (of which any filmmaker worth his salt would be jealous), you're in for a treat; if you have, you'll thrill to the extras. The only thing that could improve the experience would be the Blu-Ray bonus features being upgraded from standard definition to full HD. That quibble notwithstanding, it's been quite some time since a home video release has been this joyfully satisfying. All site content © 2000-2019 Peter Canavese. Page generated at 04/20/2019 03:55:35PM.